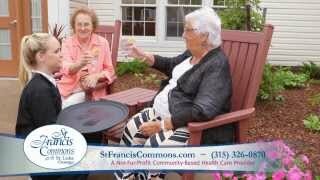 St. Francis Commons Assisted Living services combine residential community with exceptional caregiver services. Our esteemed New York State-licensed Assisted Living Program (ALP) offers seniors on-site nursing support, active lifestyles, affordable retirement amenities, and personal dignity. We know seniors desire a connection with others and want to remain independent and active in retirement, even as some may require routine medical care and assistance with daily activities. Located on the beautiful St. Luke healthcare campus in Oswego, our experienced staff is available 24/7 and provides housekeeping, supervision, care management, personal care, and home health services throughout our affordable senior residential community which accommodates up to 60 residents in individual or shared private rooms. Memory Care at St. Francis is a unique neighborhood that provides a safe and engaging setting for persons with early to middle stages of a dementia-related illness such as Alzheimer’s disease. We offer group and one-on-one activities and enclosed courtyards with opportunities to walk, garden, or visit with family. Our team of professionals provides on-site supervision, personal dignity, autonomy, independence, and personal choice, all in an environment that reflects the level of quality our community has come to expect from our St. Luke Family of Caring. For more information or to schedule a tour, please contact us today by phone (315) 326-0870, or online. St. Francis Commons is a part of The St. Luke Family of Caring, a proud affiliation of community-based, not-for-profit healthcare providers serving the greater-Oswego County area, and includes Bishop’s Commons Enriched Housing Residence and St. Luke Health Services. Together we provide community, care, and services to over 300 individuals daily.